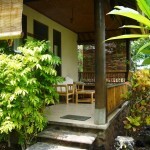 Standing only 10 metres from the shoreline, Seaview 1 is the bungalow closest to the sea. What could be better than to wake up with the sound and smell of the ocean? Early risers can watch the sunrise from their own terrace, where breakfast is served each morning. It has a big terrace on the seaside, with a bale-bale, a lounging platform of 1,5 by 2 metres, great to relax, have a nap or read a book. Or just see the fishingboats, sunrise and if you are lucky some dolphins. The terrace also has a bamboo set of a tabel and 2 chairs. The room has a 4-posted bed of 1.60 x 2.00 with a musquito-net. A large closet gives enough space to store your luggage. The size of Seaview 1 is 4×5 m, it has a small fridge, airconditioning and a ceiling-fan. The room is cleaned every day, we change the bedding every 3 or 4 days. Seaview 1 has hot water. 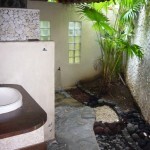 Bathrooms are equipped with western flushing toilets, shower, mirror, large sink and electric-shaving outlet.